Electric vehicles come in all shapes and sizes. Fortunately, our charging stations do too. AC Chargers (Level 2) offer charging through a 240V, AC plug at home or as a public installation. Look to Koben’s broad-based expertise to make an integrated, connected, and stylish EV charging solution a practical reality for your location. Our market knowledge and product development has set the standard for user-friendly designs and reliability. OCPP EVBOX EV chargers stand ready to serve the millions of cars that will be plugging-in instead of fueling-up. Already planning for your next electric car? No matter what it is, Elvi is here to help because she is built to evolve with you. Now you can easily upgrade your charging cable & charging capacity thanks to her “click-on” features and modular build. 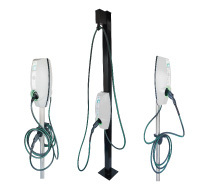 Business Line is our most versatile line of electric vehicle chargers with over 75,000 units installed around the globe. Rugged, durable and time-tested, Business Line has been successfully used in the extreme heat of summer (rated to 50 degrees Celsius) to the dead of winter (rated to -30 degrees Celsius). Smart Charging features like hub/satellite configuration, load balancing, and peak shaving ensure that your charging stations are always using your available energy in the most cost effective way. So it’s no surprise that EVBox Business Line is one of the few charging stations to be ENERGY STAR certified.